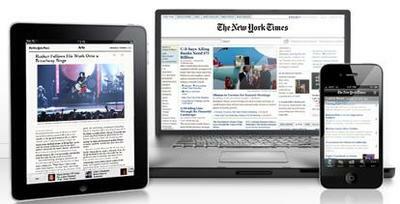 The NY Times will flip the switch on its digital paywall today, and the Grey Lady don’t come cheap: $15/month for the website and the phone app, $20/month for the website and the iPad app, or a wallet-singeing $35 for web, phone, and iPad. But there are loopholes! And they are generous. Here’s your game plan. That’s similar to the model that’s been employed by the Wall Street Journal and Financial Times, and means that if there’s ever an NYT article you’re blocked from? You can just copy and paste the headline into Google for free and easy access. Even if you hit your unspecified daily limit on Google, you can head on over to Bing or, if you’re feeling 2002 about it, Alta Vista. If that’s too labor intensive (all that clicking! ), then it’s time to make Twitter your new best friend. Between individual journos, print sections, and blogs, there are a whopping 252 Twitter accounts associated with the NYT—none of them shy about pushing out their content. Pick and choose your favorites, or for the full firehose of every single NYT article just follow @freenyt. If you’re dead set on getting yourself a digital subscription, that’s fine. Getting around the firewall is doable, but not seamless, and you may rather just avoid the hassle. Remember, though, that only suckers pay retail. The trick here is that any home delivery package includes a full digital subscription. And—conveniently enough—a Monday-Friday home delivery costs you just $3.70/week for the first 84 days, or $14.80/month. That’s less than the cheapest digital plan, and gives you unlimited web, phone, and iPad access. And when the full price kicks in, iPad and phone users are still saving a significant amount, and anyone else can just cancel home delivery switch back to pure digital. Don’t need the dead tree version? I bet you know someone who does. Just sign up your parents or your technophobic neighbor for home delivery as a gift—after they’ve promised to sign away their digital rights, of course. And remember that these loopholes are actually in place to help the Times. More home delivery subscribers, higher social media attach rates, more app downloads; these are all things that advertisers drool over. And it’s their money—not yours—that keeps newspapers afloat. Original post by Brian Barrett – Reposted thanks to Maximum PC. Covering everything from hi-end gaming PCs to tablets, peripherals and home theater rigs, Maximum PC’s print and Web editions stay one step ahead of the fast-changing world of everything computer and computing related. Whether its the latest on building your own desktop system, reviews of the latest laptops and accessories, or roundups of the games and software that make your machine go, Maximum PC brings it to you with news, reviews, and years of expertise. TechnoBuffalo is thrilled to bring you the best of Maximum PC right here on our own pages to keep you immersed in all things digital.